Home > News & Topics > Can we have a fire in a highly-vacuumed environment? Toyohashi University of Technology researchers have discovered that non-flaming combustion (smoldering) of a porous specimen can sustain, even under nearly 1 % of atmospheric pressure. The thermal structure of a 2-mm-diameter burning specimen at very near extinction condition was successfully measured using an embedded ultra-fine thermocouple, clarifying the key issues that lead to fire extinction at low pressures. 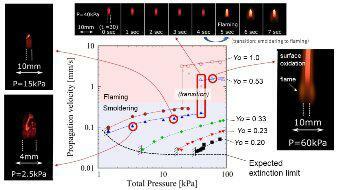 The outcome of this research will contribute to improved space exploration fire safety strategies. Full text: Can we have a fire in a highly-vacuumed environment?